Louisiana has a Master Plan for a Sustainable Coast that incorporates natural, coastal lines of defense for flood protection. Yet, the challenge of managing stormwater and flooding behind the levees, in urban areas, remains. While barrier islands, intact wetlands, levees and floodwalls protect communities against coastal storm surges, they do not address chronic flooding from rain and poor drainage. New Orleans is one of the rainiest cities in the country, with over 62 inches falling per year. Because of rain and poor stormwater management, the city is often swamped. Localized street flooding in many neighborhoods inundates cars and damages homes and businesses. The floodwaters collect,debris, oil, lawn fertilizers,pesticides and industrial chemicals. Better stormwater management will lead to a decrease in flooding. The current system of pumping rain through miles of drainage pipes, then lifting polluted water over the levees and into Lake Pontchartrain costs over $50 million per year. This process dries out the soil - causing the city to sink - and pollutes the Lake. The energy to run the pumps emits considerable carbon dioxide, contributing to climate change, which causes sea level rise and poses a significant threat to our region. The City of New Orleans has an opportunity to become a leader in sensible water policy. Stormwater could be seen as a resource to be captured and used, instead of a nuisance to be disposed of and hidden. This is an opportunity to wrestle with the impacts of climate change, water pollution and subsidence. Stormwater technologies like rain gardens, bioswales and pervious paving, can prevent flooding by slowing drainage and safely storing and filtering water. Slowing and storing the water minimizes the burden on the city’s aging and crumbling drainage infrastructure. Canals can be transformed into beautiful public spaces that hold water while contributing to a higher quality of life. Both natural and man-made land features are necessary to protect New Orleans’ unique culture and productive economy. Implementing an integrated stormwater management plan can help retain, safely store and naturally filter water before it is drained to Lake Pontchartrain and surrounding wetlands. 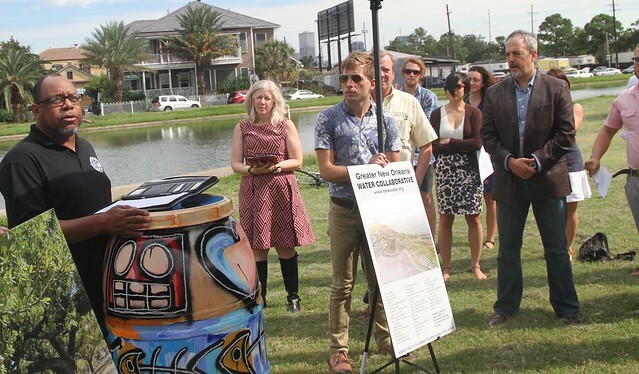 By building a stormwater management system New Orleans will strengthen its coastal lines of defense while reducing risks and protecting homes, communities and the economy. GRN continues to be a leader in the Greater New Orleans Water Collaborative. We are committed to bringing additional neighborhood and church leaders into the conversation and helping them succeed at a neighborhood level to reduce street flooding, subsidence and street runoff pollution. The Water Collaborative is a group of individuals, organizations and communities working to address critical water issues throughout Greater New Orleans, guided by the vision of the Greater New Orleans Urban Water Plan. Working within the Water Collaborative, we are engaging and mobilizing a variety of constituencies—including low-income communities and communities of color—to persuade the City of New Orleans to strategize and implement new measures that will help New Orleans flood less. If you're a New Orleans resident, you can support a Flood Less New Orleans by sending Mayor Cantrell a message thanking her for committing to better stormwater management and encouraging the Mayor to follow through on funding and policies that promote green infrastructure.